Each time you handle your firearm, salt and acts from your own fingerprints leave your gun’s metal parts prone to rust and corrosion. Moisture during use and storage is harmful as well. Don’t forget the stock. Wooden stocks need to be protected too. Ray’s is an excellent protectant and is great for long term storage. Ray’s is a decades old formula originating in the Finger Lakes Region of NY. Ray’s contains a blend of wax and highly refined mineral oil. Generations have relied on Ray’s to protect their firearms, so should you! Each time you handle your firearm, salt and acts from your own fingerprints leave your gun’s metal parts prone to rust and corrosion. Moisture during use and storage is harmful as well. Don’t forget the stock. Wooden stocks need to be protected too. Ray’s is an excellent protectant and is great for long term storage. Apply a small amount of Ray’s on the exterior metal parts and stock, removing the excess. In a clean barrel, apply Ray’s. Before firing again, clean the bore as you normally would with a quality solvent and foul the barrel before going afield. Ray’s is that simple. Ray’s unique composition is great for restoring hand rubbed finishes as well. Ray’s is a decades old formula originating in the Finger Lakes Region of NY. Ray’s contains a blend of wax and highly refined mineral oil. 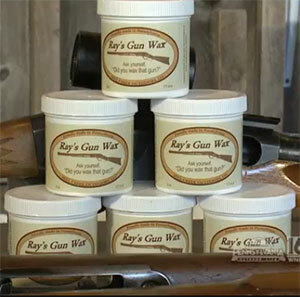 Generations have relied on Ray’s to protect their firearms, so should you! Ray’s is now proudly made in Pennsylvania and is a registered trademark of Mill Creek Outdoors, LLC.